Evernote, Todoist, Notion, and more. The 21 best to-do list apps for iPhone and Android reviewed and ranked. To-do list apps are becoming an important part of people’s daily lives. From notetaking to chores, purchases, and work, everyone uses to-do lists. They’re easy to use, simple to understand and they make most people get things done, without having the need to remember what to do. So, we decided to look at some of the best to-do list apps for iPhone and Android this year and make this list. 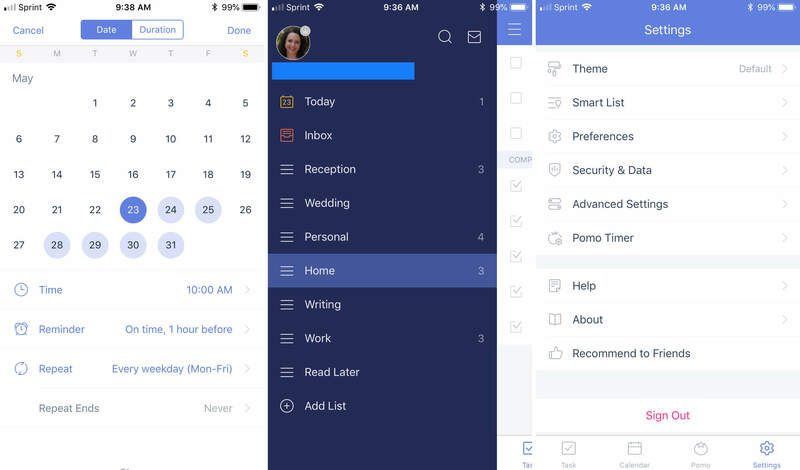 When it comes to to-do list apps, there are a lot of options available for iPhone users. I decided to check out some of the most highly rated to-do apps on the Apple Store. 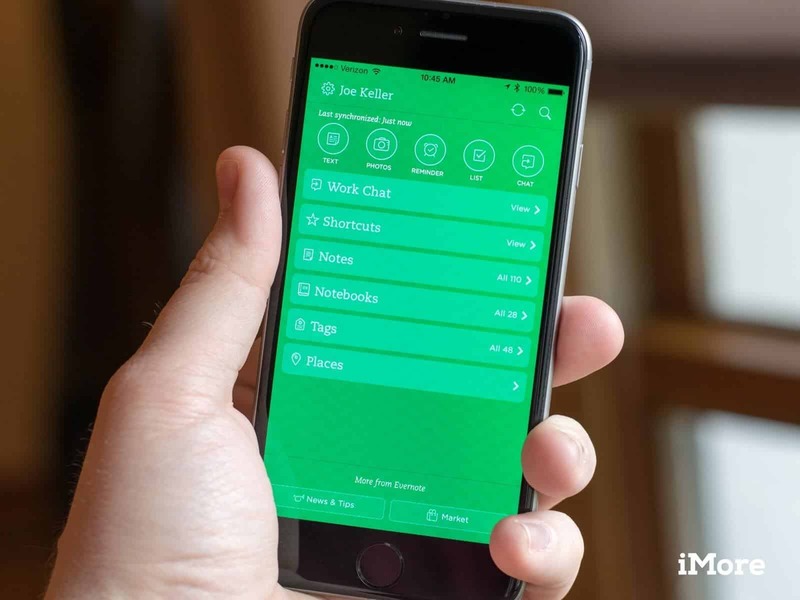 Our editor’s choice for the best to-do list apps for iPhone is Evernote. From notes to lists, organizing tasks, archiving, and more, Evernote offers a comprehensive productivity package for everyone. It’s simple and easy to use, which makes note-taking easy and effortless. Evernote has its own web clipper, which makes it easy to pull content from the web and attach it to your notes in Evernote. You can save web pages, articles, videos, links to how-to articles, and more. It syncs on all your devices so anything you clip using your phone on the go will be made available to you the moment you open Evernote on your PC. Another great feature that comes with Evernote is Search Handwriting. While handwritten notes might not be such a revolutionary feature, the ability to search handwritten notes is awesome. Evernote detects text you’ve handwritten and later makes it searchable so you can get back to your old handwritten notes without a problem. Furthermore, there are tons of templates for you to get started with. From meetings and appointments, to Creative Writing, Marketing, Gettings Things Done, and more, you can find ready-to-use templates that will help you save time setting up tasks, notes and to-do lists in Evernote. If you’re not using Evernote already, you are missing out. Evernote reported earlier that more than 200 million people use the app to organize their personal and professional lives. Todoist needs no formal introductions. It is one of the world’s best to-do list apps that offers a feature-packed to-do list app for iPhone. 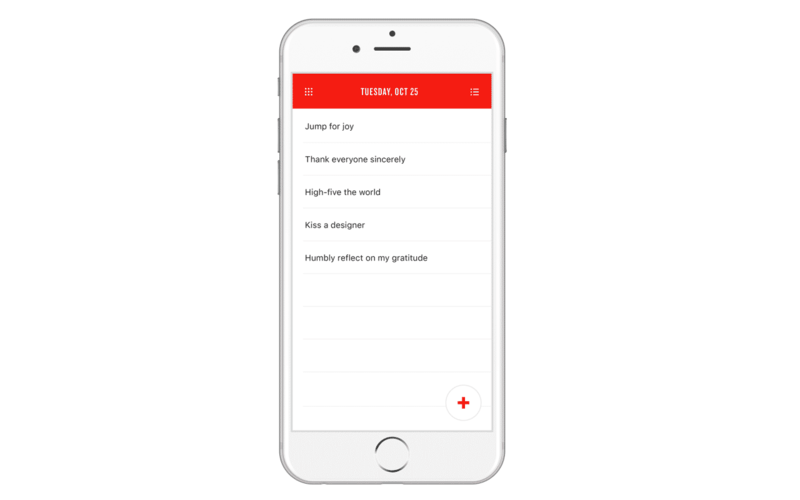 Notes, checklists, tasks, projects, to-do lists, and more – everything can be organized using Todoist for iOS, making it our second recommendation for the best to-do list apps for iPhone. To help you quickly get started, Todoist comes with native templates catering to both your personal and professional life. You can choose from an array of options available, so that you don’t have to start everything from scratch. The quick add feature of the app allows your to-dos to never slip your mind. Instantly jot them down as they come to your mind and check them off once done. Add color codes and due dates to give them context. Todoist also comes with an activity stream to keep you updated about what your team members are working on and what needs to be done next. Not only this, you can also track your progress through multiple progress reports. An interesting feature of this to-do list app which caught my attention was the Karma points. Each time you successfully accomplish your goals and complete your tasks, you earn Karma points and move up on Karma levels. This greatly assists in tracking your productivity levels and your performance. Free – for starters, up to 80 projects, up to 5 people per project. On #3 of this roundup of the best to-do list apps, we have a new entry. I have been following Notion over the past few months and I have seen them grow tremendously both in terms of popularity, as well as a platform. People really love using Notion, and there is lots of praise for this app, so it was only right that it made it to my roundup. You can take Notion as an internal wiki to keep your organizational data in one place and plan your projects in a better way. Through a flexible user-interface, you can organize your projects using Kanban view, calendar, or a simple list view. Like most to-do list apps, Notion also comes with native templates to give you a head start when managing projects. These templates are fully customizable and can be molded according to your needs. Notion is available across all platforms, including iOS, Android, Mac, Windows, and Web. Notion App does not offer support for Apple Watch as yet. Any.do is another excellent to-do list app for iPhone. From notetaking to to-do lists, calendars, planners, scheduling and more, Any.do lets you streamline daily productivity efficiently. The design is minimalistic and keeps things clutter-free, which is why Any.do grabs the 4th spot on our list of the best to-do list apps for iPhone. 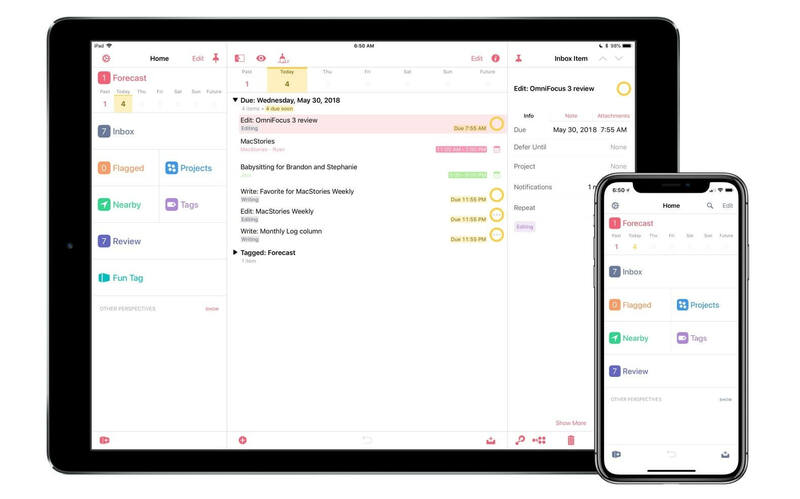 The calendar view of the app allows you to sync your to-dos with your calendar and add smart reminders, so you don’t have to miss any major event. You can also add recurring and location-based reminders to get things done faster. Any.do comes with an exclusive personal assistant functionality too which facilitates in completing your to-dos without you doing any effort. The virtual assistant lets you add to-dos through Siri and Alexa to further make things easy for you. It can come in pretty handy if you’re in a hurry and instantly need to do something, like quick flight bookings or appointments of any sort. On top of that, there are multiple task management features provided by the tool too. Organize and visualize your tasks through Kanban boards and easily assign them define accountability. The cross platform sync of the app facilitates in seamlessly accessing your work from anywhere. Wunderlist for iPhone is another excellent contender for this roundup of the best to-do list apps for iPhone. With Wunderlist, you can manage all your tasks, to-do lists, checklists, and more using a simple and smart organizer on your iPhone. This to-do list app is perfect for you if you’re not looking for a myriad of task management features that’re too complicated for your simple to-do list management needs. Cherry on top is the simplistic user-interface which further makes lists management a smooth experience for you. For managing related lists, you can easily group them in separate folders, so that you can quickly sort and access them at any time you want. The easy drag and drop functionality lets you instantly organize your lists into relevant folders. The created lists can also be easily shared with anyone with a Wunderlist email to collaborate seamlessly. The people in shared list can view, edit, assign, check and un-check to-dos, and comment on the file. Another useful feature the tool comes with is the mail to Wunderlist. If your emails consist of tasks, you can easily turn them into actionable to-dos by simply sending the email to yourself. The app will readily place your task into the Wunderlist inbox and will attach the body of the email in the form of a note. With the latest Wunderlist for iPhone update, the Apple Watch version has been deprecated. The Apple Watch version of Wunderlist now only supports reminders and notifications. Wunderlist is a free tool. 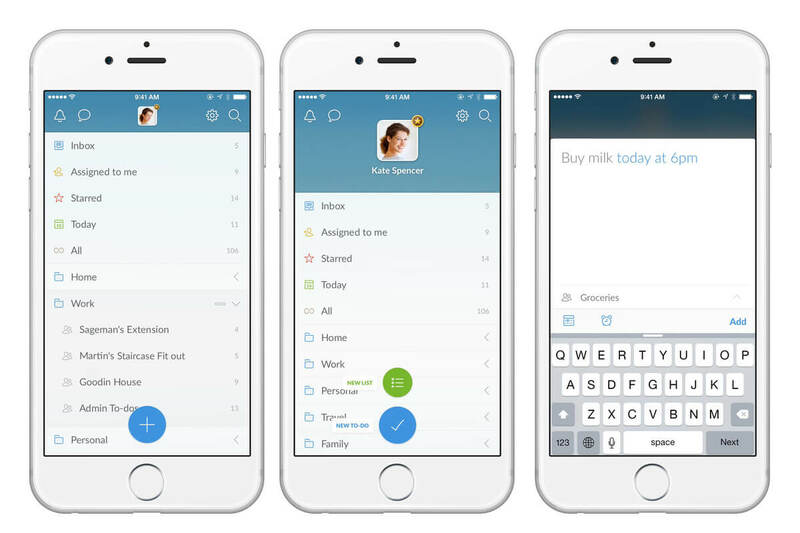 #6 on our list of the best to-do list apps for iPhone is Microsoft To-Do. Be it work, school or elsewhere, To-Do can be a great task management and to-do list planner for your needs. It has an elegant user interface and setting up only takes a few seconds. 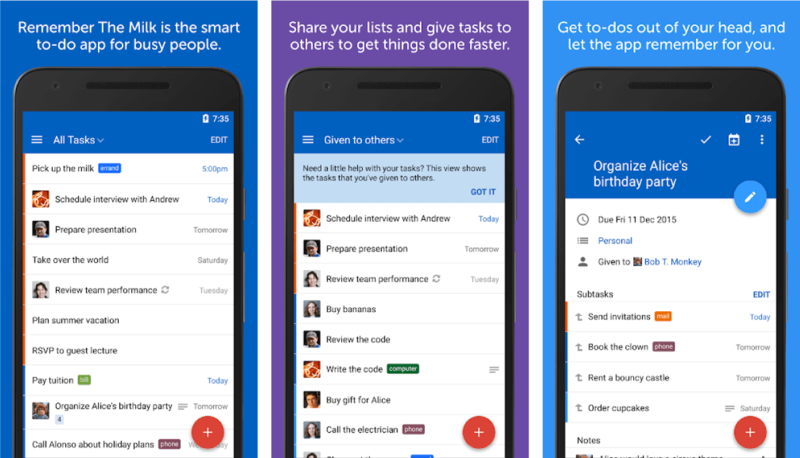 This to-do list app is perfect for you if you’re an avid Office 365 user. The tool allows you to easily create your daily to-dos from scratch, or directly import from other tools, like Outlook and Wunderlist. Through My Day list, you can easily jot down your daily errands and prioritize them according to urgency. Adding due dates, reminders, color codes, and additional notes with your to-dos are some of the ways the app helps to keep track of your important tasks. Furthermore, you can also easily share your lists with your friends, family, or coworkers to collaborate on things that matter. The app syncs pretty neatly across platforms, making it easy for you to switch between your devices and work from anywhere. Microsoft To-Do for Apple Watch only displays reminders and notifications using Reminders on the Apple Watch. Simply sync your wearable with your Outlook or Exchange account and you can now enable reminders and notifications from Microsoft To-Do. Microsoft To-Do is available for free. #7 on my list is Things 3. I haven’t used Things in a while, but I have heard great things about it and decided to test it out. 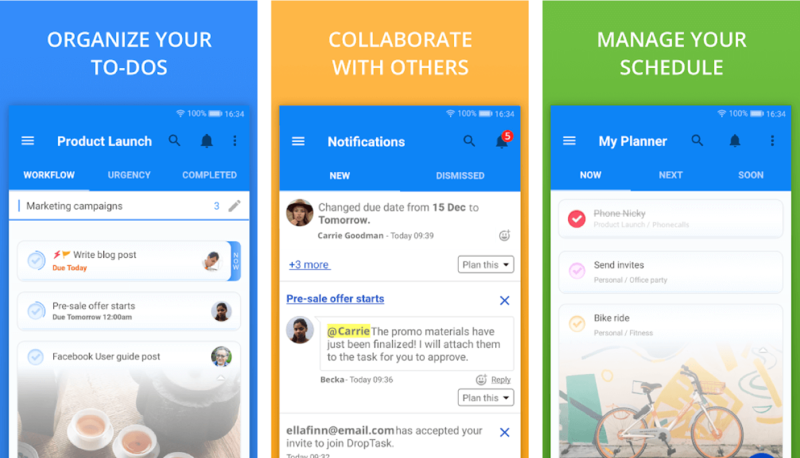 The third version of this to-do list app offers its users a beautiful design revamp with great added functionality. The app not only allows you to take notes but also to create supporting checklists for specific notes. The checklists can be together, or you can put those into sections if you want to. You can easily use Things across your Apple devices and even bring all the notes and events from your iCalendar to Things with one click. With a simple and minimal interface, Things 3 hits all the right spots. Instead of forcing you to click multiple times before jotting down your to-dos, Things 3 provides blank white paper when you open the app, making it distraction free. Add tags, due dates, and a start date to give your to-dos more meaning. The calendar view of the app syncs all your tasks and displays them according to their due dates. The Today list specifically comprises of all the tasks that are due today. The app also caters perfectly to people who like less, with slim mode. By activating it, the two-finger swipe collapses the sidebar and all the focus is turned towards the task at hand. Bear App ranks #8 on this roundup of the best to-do list apps for iPhone. It provides a simple page with no distractions to make your lists, notes or plan your day. You will be able to use different inline styles to do much more with your text. The beauty of the Bear app is that it gives you plenty of functions but keeps your workspace clean and simple in the “focus” mode where you can concentrate on the job. The aesthetically pleasing interface of the app makes managing work even more fun. Through different themes, you can personalize your app according to your preferences. As far as writing notes is concerned, Bear provides pretty interesting features for you to manage them. Link your notes to each other and add hashtags to organize them the way you want. The custom editing tools allow you to add styles and make changes the way you need. 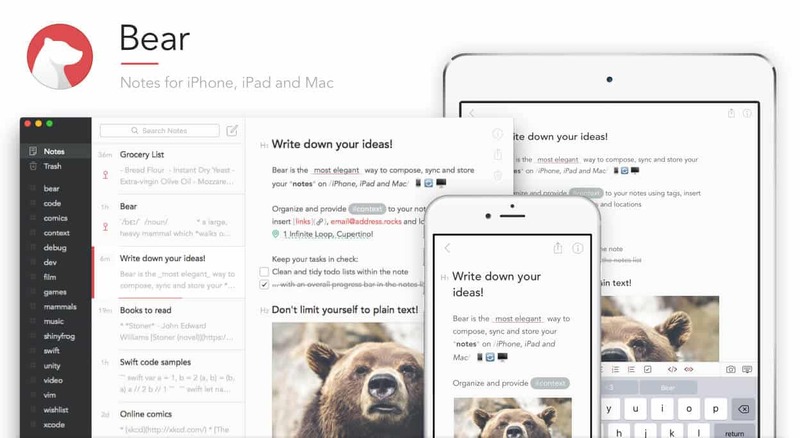 With Bear, you can write articles in notes with appropriate formatting and preview options. You can set the word count too (pretty cool, no?) When you’re done, you have options to convert the notes to Word or PDF. Smart data recognition for emails, links, etc. OmniFocus is a great task management app which so many features that can be even used as a project management app. It comes in different customizable sections and allows you to have projects as well as sub-projects where you can add checklists, notes, and attachments to each of them. This is an easy-to-use application for teams and individuals who what to achieve the highest efficiency level while working on their projects. A powerful GTD application, Omnifocus 3 lets you create actions and add tags to them to categorize them according to their type. Moreover, you can group your actions by respective projects to manage them effectively. For easy organizing and accessing tasks, you can also color code them. The Forecast view of the tool displays your due tasks and gives you a clear picture of what lies ahead in front of your schedule. The tags can also be added to the Forecasted view. 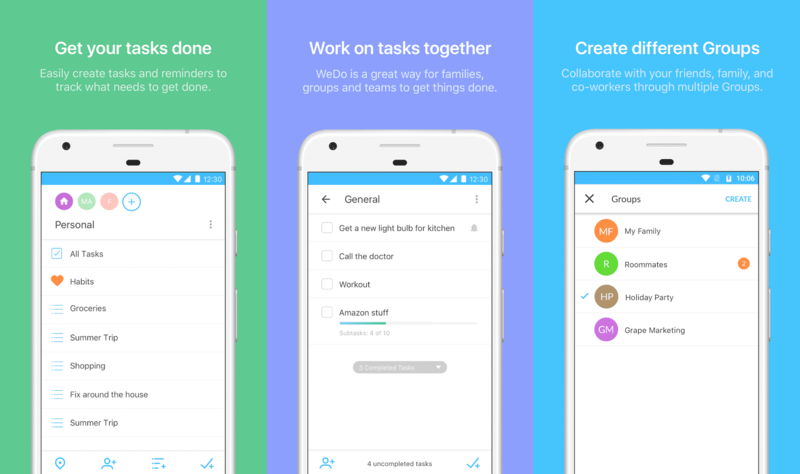 WeDo is a free to-do list app for iOS and it also has an Android version. The app is very easy to use with its user-friendly interface. You can link your app to your calendar, create notes and checklists, prioritize those, add attachments and much more. This easy to-do list app not only helps you to complete tasks, but also build habits with custom habits list. The array of features WeDo comes with help you to stay on top of everything without losing focus. 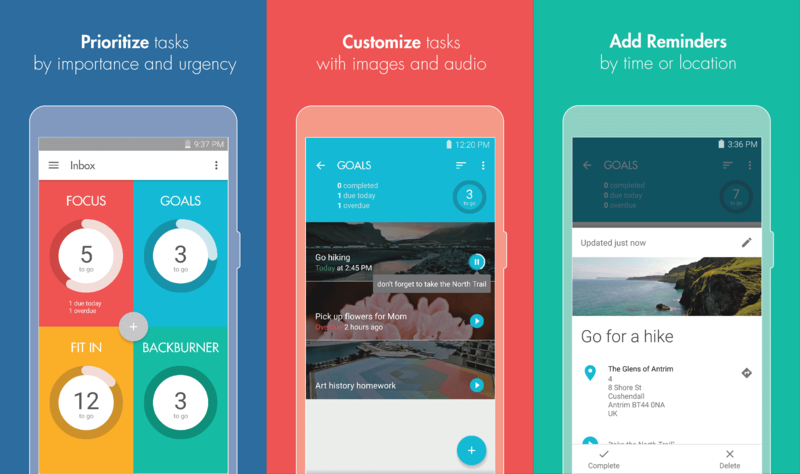 The app lets you break your tasks into subtasks to keep everything organized in one place. If you need to collaborate with your team members or friends, just create groups for your tasks and lists and easily share them to get started. The due dates and reminders will keep everyone in loop with what needs to be done next. The time estimation functionality provides a platform for you to estimate the time it will take for tasks to get done, so you can plan the next course of action accordingly. The best part about WeDo is that the core features of the app are totally free, and the upgraded version doesn’t put a dent in your pocket. If you need extra functionality you can make a little payment anytime and enjoy WeDo Pro. TeuxDeux is yet another one of the best task list apps on our list. It doesn’t come for free but it has 30 days of a free trial version to give you the taste of what it means to use TeuxDeux. Instead of fitting in every task management feature in the app, the focus is only on to-do list management. Simple and straightforward, TeuxDeux makes sure you’re not overwhelmed while getting things done. Create custom lists according to the category of your to-dos and easily drag and drop them in the respective list to make sense out of them. For to-dos repeating on regular basis, quickly add them to a recurring list and the app will make sure to give you a reminder every day. Not only this, you can also easily make changes to your text through formatting abilities of the tool. If you’re always on the move and would like to keep your to-dos with you, the mobile app of TeuxDeux takes care of that for you. The app is designed for iOS users and it looks like a spreadsheet where you can add your tasks. But calling it a spreadsheet is an understatement because it has a lot more functionality than a spreadsheet would have all to make your tasks easy to track and remember. TeuxDeux comes with a 30-day free trial, after which it costs $3 per month. TickTick is one of the most highly-rated apps on the Google Play Store. It is a simple to-do list app, but offers great features and functionality. 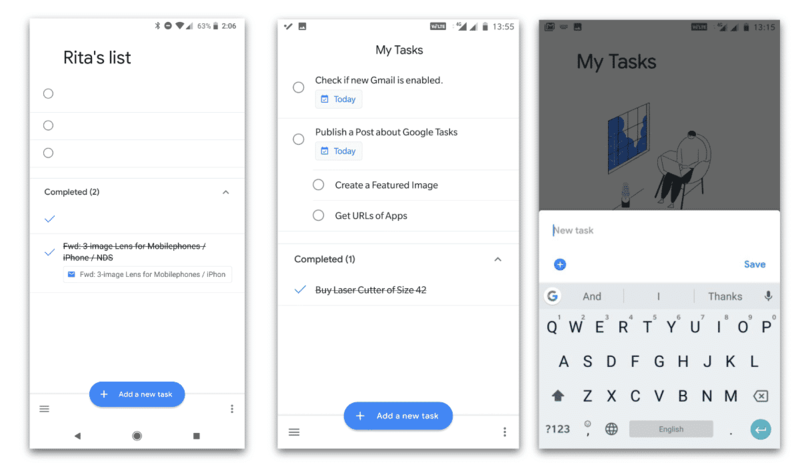 With a simple and easy-to-use UI, seamless sync, and a recurring task feature that helps automate task creation, TickTick grabs the 12th spot in this roundup of the best to-do list apps for Android. 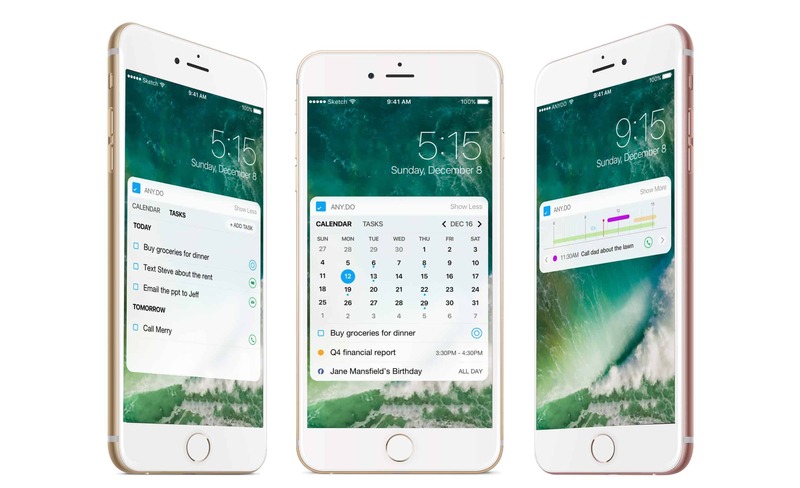 The calendar view of the app allows you to easily drag and drop tasks on the desired date to set a schedule without any hassle. You can also integrate your tasks with other third-party calendars to further streamline your tasks. The to-do list app comes with an interesting set of eye-catching animations and design which give an appealing look to the platform. Additionally, TickTick comes with ‘seasons’ and ‘themes’ to perfectly match with your mood and take better control of your background. Moreover, if you’re prone to forgetting things when on the move, you can set location-based reminders to alert you whenever you need to do something, like pick up groceries from your favorite store. What could offer a more stock Android experience than Google’s own task manager? Earlier in 2018, Google announced that it will make Tasks a standalone service, offering its own mobile apps and integration with the new Gmail redesign. Google Tasks is a great to-do list app if you’re looking for simple, minimal design and straightforward functionality. I do believe that Google Tasks is lacking some functionality for now. Although it’s a basic to-do list management app, but the integration with Gmail and Google Calendar increases its functionality and makes up for a compelling tool. Google Tasks allows you to create tasks inside your email and then link these tasks with your calendar. Track your deadlines easily by adding due dates and reminders to get alerts. 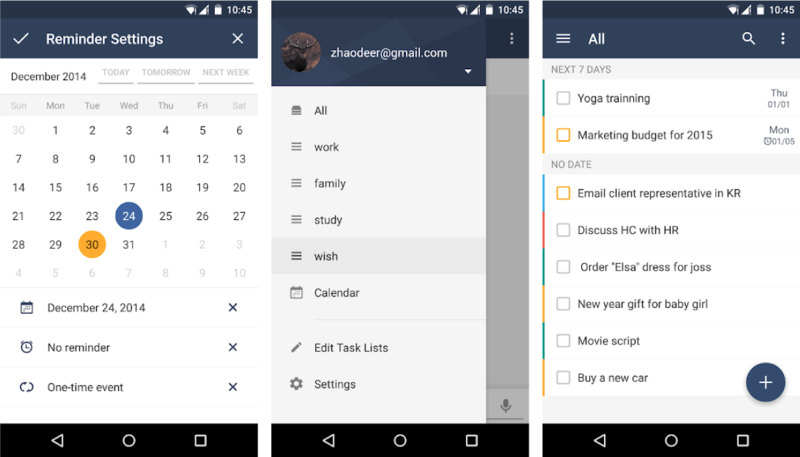 However, it seamlessly syncs across all your Android devices and offers the most stock Android experience available on any to-do list app, which is why Tasks grabs the 13th spot in this roundup of the best to-do list apps. Google Tasks comes free with a Google account. Next up on my list of the best to-do list apps for Android is Memorigi, a to-do list app, task planner and reminder. The creator of this app, Randy Saborio, claims it to be the simplest to-do app on mobile. Upon signing up, you are redirected to your tasks list. Tap on the + button and get started. It’s simple as that. Memorigi comes with gesture control features, a floating action button to quickly create tasks, recurring tasks functionality, and a lot more, and that’s why it’s scored the 14th spot on my list for the best Android to-do list apps. If you go a little deeper, the word ‘Memorigi’ literally translates to remind, which basically sets the basis for what the tool has to offer. To avoid the hassle of creating repeating tasks from scratch every time, the app lets you set reminders on the basis of frequency of recurrence. The smart location reminders help you to never forget a thing when leaving or arriving at any specific location. Yeah, you don’t have to worry about forgetting a grocery item now! There’s also an integrated weather reports functionality. Although it’s not really an amazing addition, but it lets you smartly plan your day or week ahead. 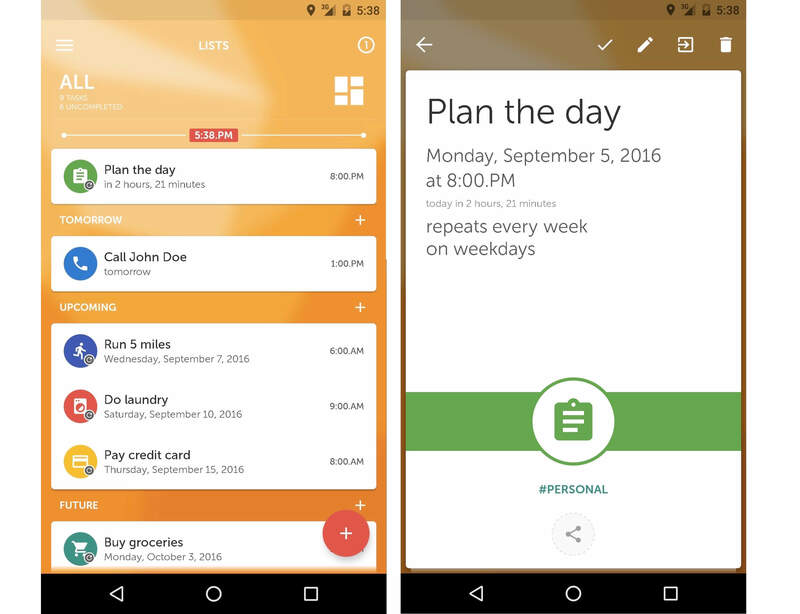 The 15th to-do list app (#4 for the Android roundup) I’d like to share is Ike. It is inspired by the famous Eisenhower Matrix for time management and productivity. In Ike, you prioritize tasks by importance and urgency. Prioritizing tasks is the first thing you do in Ike, rather than selecting it afterwards. You can also create widgets out of Ike for your Android device to view at a glance what needs to be done and quickly access tasks in Ike. There are various other features that make Ike a great contender for this roundup of the best to-do list apps for Android and iPhone. Ike takes on a minimalistic approach, instead of overwhelming users with tricky features. It ensures this by providing easy, but essential features for to-do list management. For successfully running daily errands and completing chores, Ike helps to prioritize them, and check them off once done. You can also add images or recordings to your tasks to give them more context. An exciting thing about the tool is that each time you complete a task, customizable animations are played as celebrations and you get that instant shot of satisfaction. 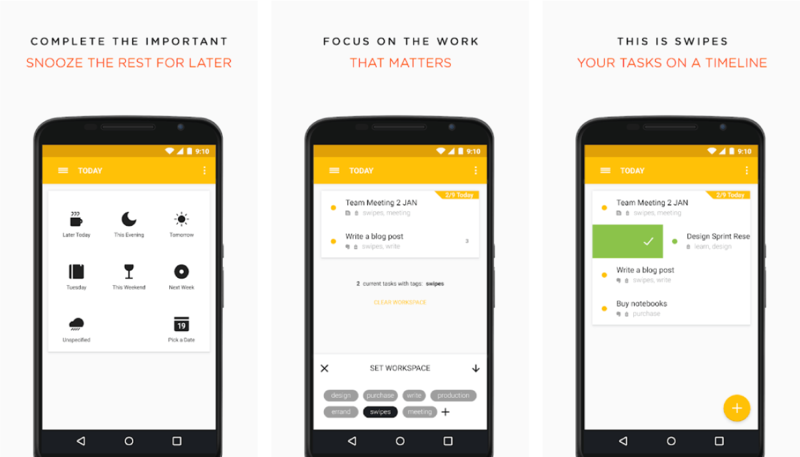 My 16th pick for this roundup of the best to-do list apps for Android is Google Keep. Before Tasks was released as a standalone service, I avidly used Google’s Keep to note down important stuff and keep track of things to do. With Tasks offering more dedicated features to manage tasks and to-do lists, Keep has since then become more of a substitute for me. I still use Keep, but mostly to take notes and jot down things to sync between my Android devices. 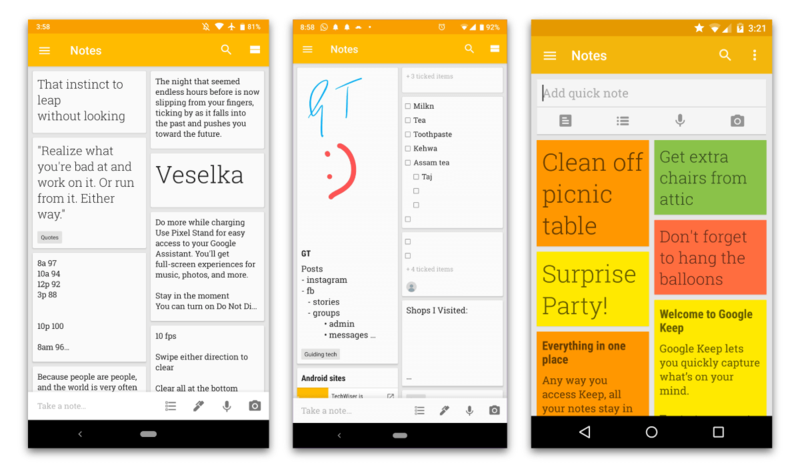 Google powered simple note taking app, Google Keep made to my list primarily because of its extreme simplicity. If you’re looking for a basic to-do list app, it might be best suited for you. Although the tool doesn’t come with a rich feature set, it provides enough for creating simple checklists on the go. Keeping your inner creative kid at peace, Google Keep provides colorful sticky notes which help you easily organize and manage your tasks. If you hate shopping alone, Google Keep got you covered! Instantly share your grocery list with your friends or family and check off items in real time. The sync with multiple devices helps you to always keep your head in the game and take your notes with you wherever you go. Google Keep comes free with a Google account. Another one of the best task list apps that I would love to share in this article is DropTask. This is a visual task management application introduced by OpenGenius. They claim that the app can seamlessly adapt to the user. It’s not a coincidence that the app is called a visual task manager. Instead of traditional lists view for managing to-dos, DropTask offers multiple project visualizations, like Kanban workflow to track tasks better. My planner feature allows you to keep track of your next in-line tasks and make quick changes if your priorities change. You can also evaluate your performance better by keeping a check on tasks’ completion percentage which gives you a clear picture of how much a task has been completed successfully. The tags and filters help with categorizing your tasks in an effective way, so you don’t have to juggle between multiple options before retrieving them. Everything you see on the app, as well as the desktop version, is visualized which makes it appealing to the eye and extremely easy to use. There are numerous features on the app but let me share with you the best ones. The next item on my list of the best to-do list apps for Android is GTasks which is a simple and efficient task management application. 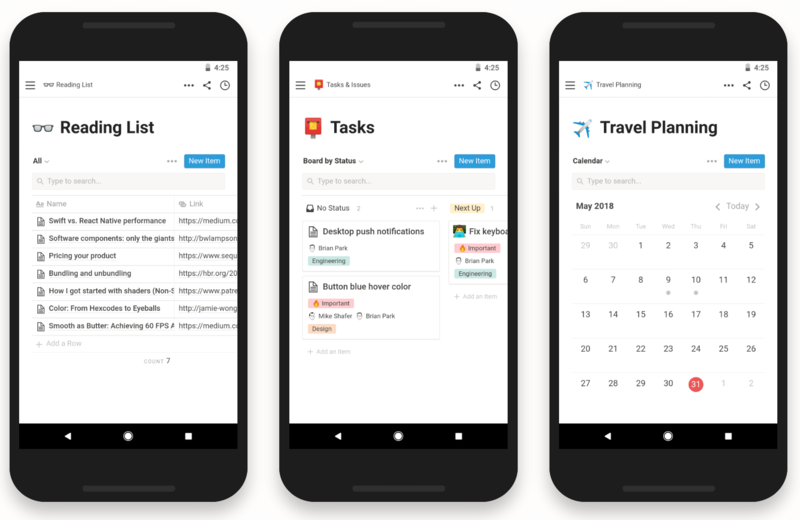 Along with simple personal task management functions, the app will allow you to share your tasks with others and sync the application with Google Tasks and Calendar. As a result, you will be able to have access to all of your notes across multiple platforms and will more functionality to be more efficient in your daily and professional life. GTasks provides everything you need to manage your lists without getting frustrated with the useless features that you don’t need, but are presented with anyway. Set due dates, deadlines, and additional notes to your tasks to always stay in loop and get done with things. Remember the Milk is also one of the best to-do list apps for Android designed for busy people who need to be reminded of their daily tasks. It is basically a personal assistant in your pocket. The app works with the famous apps like Gmail, Google Calendar, Twitter, Evernote, IFTTT, and more. 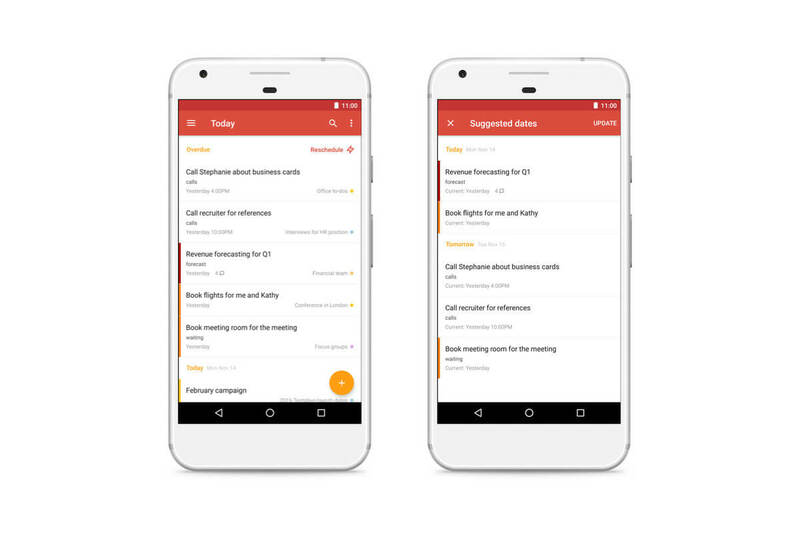 It can also be considered as one of the oldest to-do list apps out there which lets you highlight your most important tasks for the day through smart lists. Like many apps in this roundup, Remember the Milk also provides due dates, priorities, and tags to help you better organize your to-dos. Although the tool doesn’t have a revolutionary design that’ll make your jaws drop, it still pretty much manages to provide a clean interface, and so you don’t feel cluttered while moving your way through your tasks. The multiple search filters facilitate in quickly finding the tasks without getting lost in endless scrolling within the app. You can also add tasks through your email, tweet, or personal assistants (Siri, Alexa, Google Assistant) if you’re in a hurry or on the move. This makes your job easier and more enjoyable because when these many useful apps come together you won’t be able to forget any of your tasks. Plan, take action, discuss. This is how Swipes works and creates value for its users. They believe that if there is an idea and a team that wants to work on it they should start from planning on Swipes. This to-do list app comes integrated with Evernote and Gmail to help you easily export your tasks without a glitch. Once you have all your tasks in one place, add priorities to arrange them according to urgency. Without a doubt, Swipes has a neat interface and a short learning curve which makes it extremely convenient to quickly get a hang of the tool without losing your mind. There is also a task snoozing option in Swipes that lets you snooze your tasks till you’re finally ready to work on them. Next, when the team starts taking action they can track those actions on Swipes and discuss it on the comments to achieve greater results. Swipes Workspace is available at $7.50 per user/month, paid monthly. Unlimited file storage, templates, notes, built-in browser, and all the other features. 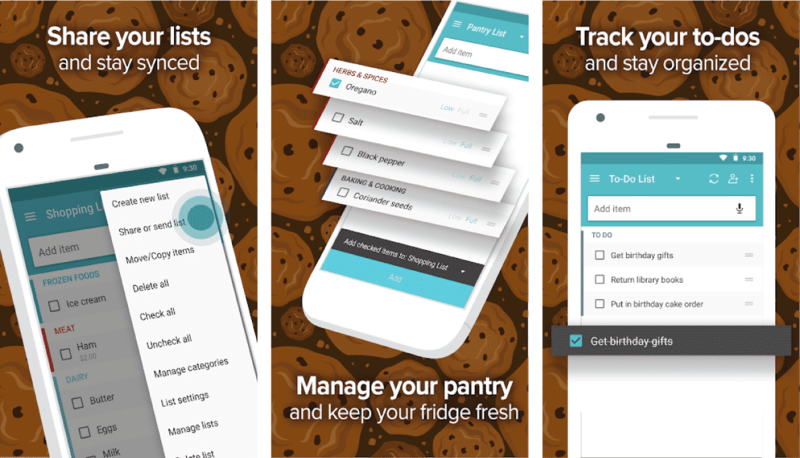 Out of Milk is a free to-do list app for Android and iOS devices. It is designed to help people with shopping. It has several parts for different types of lists, such as shopping list, to-do list, pantry list, and recipe book. Each list on the application compliments the other. For example, if you are low on milk or eggs at home the app will remind you to buy it. And if you already have the item you are planning buy, the app will again let you know. Through the Cart feature, you can keep track of what you’ve bought and what you couldn’t, so you can buy it the next time. The native grocery list templates minimize the effort you go through while enlisting items for occasions. The dread of shopping alone is also not there through sharing lists option. When other people make changes to lists, they automatically appear in your lists too. But Out of Milk isn’t just for shopping lists. You can also create various to-do lists to help you with different areas of your life. Out of Milk is a free to-do list app. 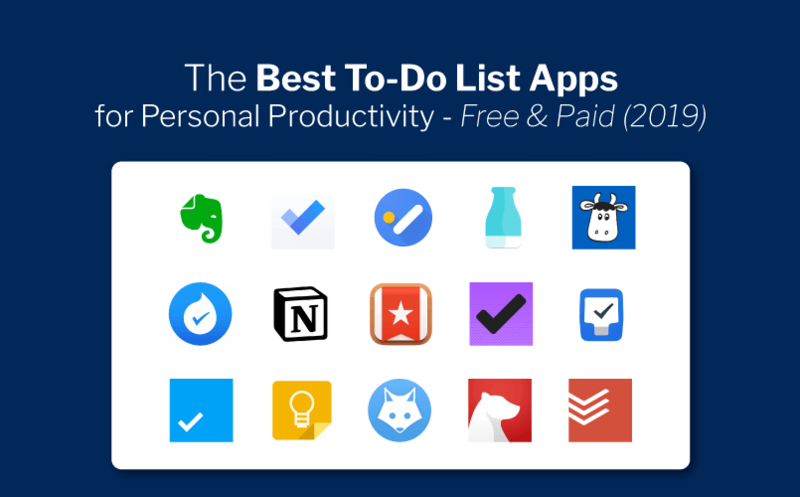 So, this was it – 21 best to-do list apps for iPhone and Android devices that you can start using today to optimize productivity. Which one did you like the most? What to-do list app are you using on your smartphone? Let us know in the comments below.